The finish of the light is very good being self colored aluminum with a nice dark line in the cracks accenting the design of the light. The detail of the carved shades in this pendant is simply outstanding. 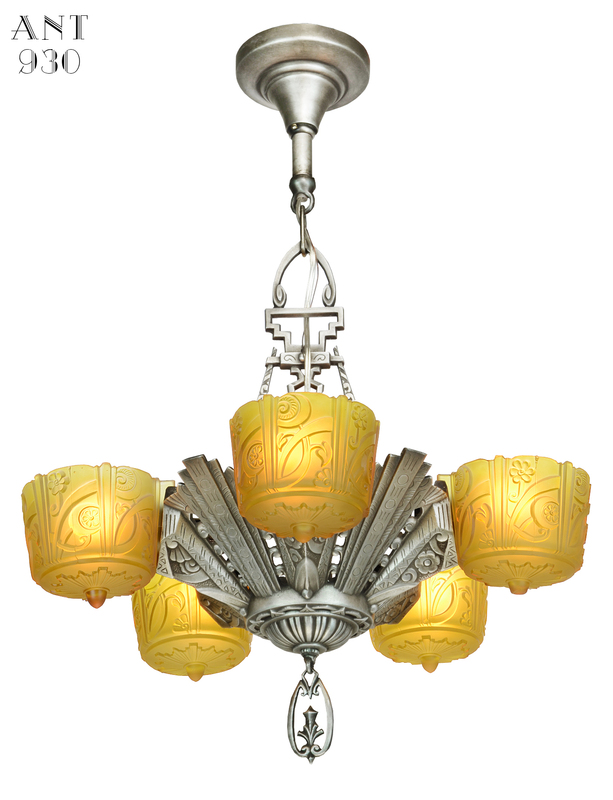 These carved amber shades are simply remarkable for color and design and condition. Amber is normally preferred when collecting art deco lighting...and you really have to go some distance to find nicer deeply carved amber shades than these. This light has been rewired in our ULâ€ˆshop and still has the ambiance of a 1930s light. New sockets, with new central lead wire, were installed. Each socket is capable of a 100 watt bulb, or purchase our optional LED bulbs to maximize your energy savings. Makes running this ceiling light all night long, perhaps as a nite lite, very economical indeed and cool to the shade as well. 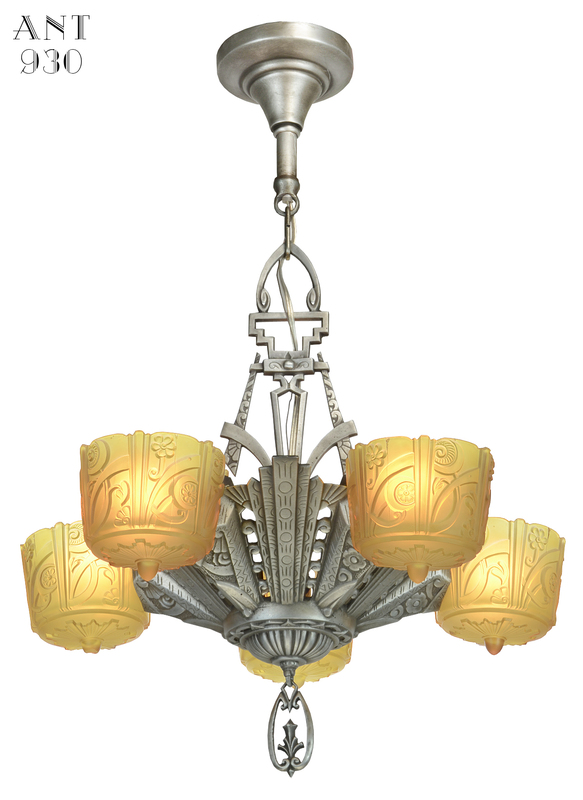 A UL rewired, authentic 5 shade art deco Lincoln Chandelier. Ready to hang. Measurements: This fixture measures 28 inches tall from the ceiling to the bottom of the finial and has a diameter of 19 inches. 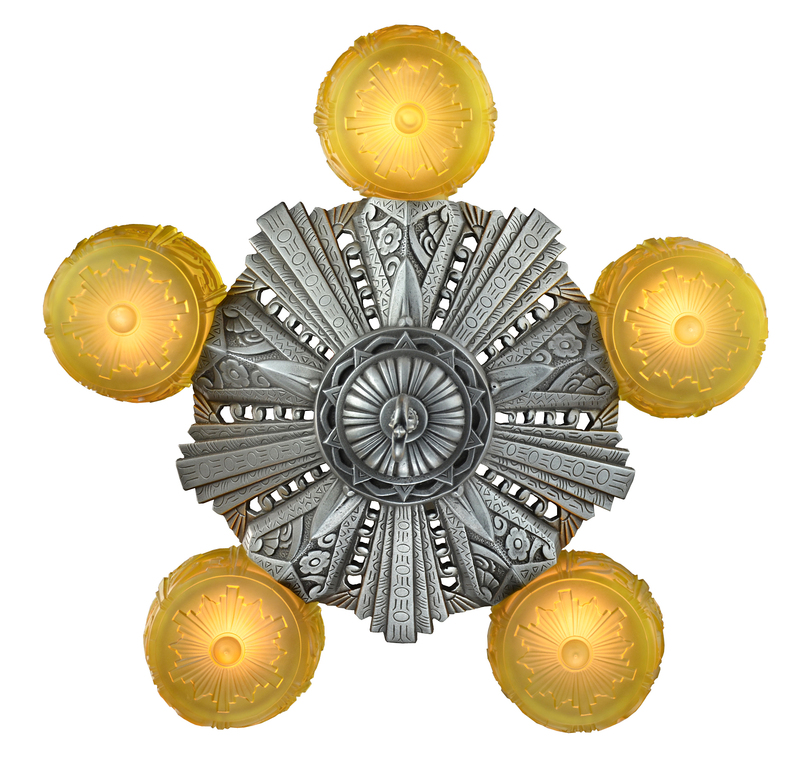 The ceiling canopy has a diameter of 5 inches. We will supply the bracket (crossbar) for this light so literally, you can hang this light and have it working minutes after receiving it.